For childhood friends Leo Kelly, Jane Devlin, and newly ordained "Packy" Keenan, the summers they spent at the lake together were times of pure magic. And no summer was more enchanting than the summer of 1948 - until a tragic car wreck killed two of their friends. The rich and prominent "Old House" families of Chicago banded together to protect their own - the driver, who was drunk, was the son of a local doctor. There was a cover-up and a vicious scandal. Leo left for the Korean War, and the three friends' summers at the lake were gone forever. 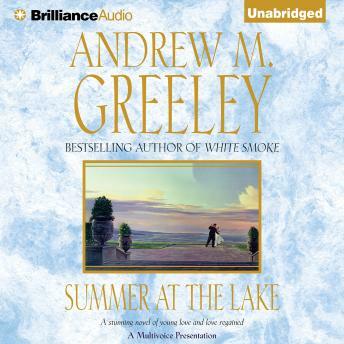 . . Until thirty years later when Leo, still obsessed by the memory of Jane and the need to solve the mystery of what really happened that fateful summer, comes back to Chicago and back to the lake. Jane is more beautiful than ever, but her life has been an unhappy one, trapped in a loveless marriage and haunted by the memory of Leo. She has returned to the lake to try to piece her life back together. Disillusioned with the priesthood, Packy realizes he's in love with Jane, too. But as a best friend and confidant to Leo and Jane, he faces a difficult choice this summer: should he help his oldest friend win back the woman of his dreams or pursue what might be his own last chance for love?